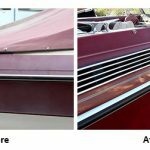 Will Waterline Stain Remover remove tannic acid stains? Can you tell me if Aurora Waterline Stain Remover will remove the brown “moustache” we get on the hull in South Carolina waters caused by the tannic acid in the water? Yes, Aurora Waterline Stain Remover is very effective. Roll it on, full strength with a disposable paint roller, wait 20 minutes and rinse away the stain with a garden hose. Be sure to work up-wind. It’s smelly stuff. 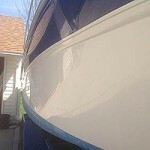 After, I recommend scrubbing the bottom with Boat Scrub and applying 2 coats of VS721 Bottom Coat to protect your boat and make it easier to keep clean.